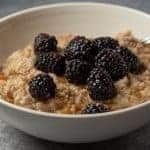 This is the best oatmeal recipe – ever! 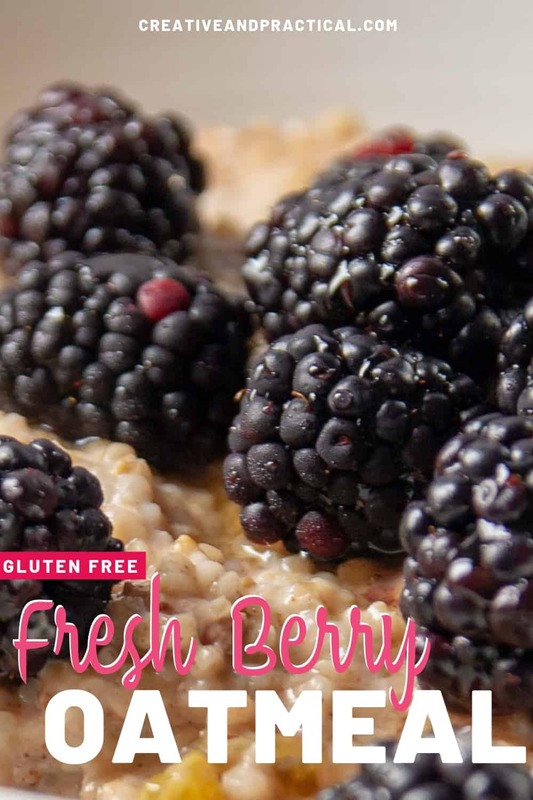 What could be more perfect than classic steel cut oats, fresh berries, cinnamon, crushed pecans, and maple syrup?! It’s the perfect flavor combination to make this oatmeal recipe unforgettable. 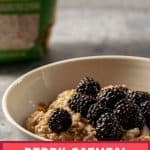 You’ve got to try this oatmeal recipe – it’s AMAZING! Can I eat oatmeal if I am gluten free? Oats contain a protein called ‘avenin.’ And avenin has similar properties to gluten. But the good news is that most people who are gluten-intolerant can process avenin without any problems. (Again, yay!) And although oat sensitivity is rare, it does exist. The bigger problem is cross-contamination. Because some manufacturers process gluten containing products in the same facilities as gluten free products, cross-contamination can happen. It means that unfortunately, we’ll have to read labels. If the label checks out to be certified gluten free, you’re good to go. If there’s no certification label, you’ll have to decide for yourself and weigh the risks of potential cross-contamination. It takes no time to make this yummy oatmeal recipe. Literally, less than 15 minutes! And it’s going to keep you full for hours. Making oatmeal from scratch is actually quite simple! True Confession: My oatmeal turned out clumpy and even slightly burned at times. And for years I mostly used single serve microwave-ready packages of oatmeal. What changed? I discovered that you have to reduce the heat to a very low simmer once the milk has come to boil. So, to make perfect (steel cut) oatmeal every single time, all you need is a medium-sized saucepan (with a lid), a spatula, and a timer. If you don’t have a timer in your kitchen, you can use the built-in recipe timer in the recipe card below! Bring the water or milk to a boil. I use unsweetened vanilla almond milk like this one. Once the milk has come to a boil, add the steel cut oats, and reduce the heat to a low simmer. Make sure to stir the mixture every few minutes and cook for about 10-15 minutes. Add cinnamon, raisins (dried cranberries or dried cherries are great, too), crushed pecans, a dash of salt and stir well. At this point, you can add maple syrup. But I actually prefer to drizzle it on the berries. Keep an eye on the consistency of the mixture. For me, the perfect oatmeal recipe has to be creamy rather than thick. And sometimes I’ve upped the amount of (almond) milk I use. But that’s a personal preference. Steel cut oats are going to keep you full for a long time. Oats contain fiber! And in fact oats contain both soluble and insoluble fiber! Pretty sweet. Soluble fibre helps your body to absorb important nutrients. And insoluble fiber helps you to be regular! Steel cut oats are also a good source of protein. Oats also contain lots of minerals such as magnesium, manganese, iron, and zinc. 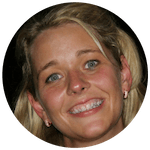 If you want to know more about the exact nutritional information go here. 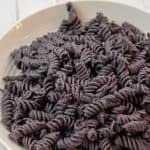 If you’ve either been told to lay off gluten or if you have made this a lifestyle choice, check out these easy gluten free recipes. Steel Cut Oats vs. Rolled Oats? The good is that both steel cut and rolled oats are healthy! But because steel cut oats are less processed, they hold a slight advantage over rolled oats. It’s all in the processing. Oats are a type of cereal grass. For steel cut oats, the whole grains are split into smaller pieces. To make rolled oats, the groats are first steamed and then rolled. As a result, rolled oats cook faster than steel cut oats. But as you can see making a delicious steel cut oats doesn’t take much time either! Nutritionally, steel cut oats have a lower glycemic index (42) than rolled oats (66). That said, overall the benefits of using steel cut oats or plain (gluten free) rolled oats, are pretty similar. Single-serve (flavored) ready oatmeal has less nutritional benefits because the more processed food is, the less beneficial it is. And you’ll find that some oatmeal flavor packs have a lot of added sugar. And if you’re trying to manage your weight, it’s best to reduce the amount of processed foods. But here’s the deal. No matter which type of oatmeal you choose, it’s still a pretty healthy breakfast option. Is It Good To Eat Oatmeal Every Day? Oatmeal is one of the very best ways to start your day. It has lots of health benefits. 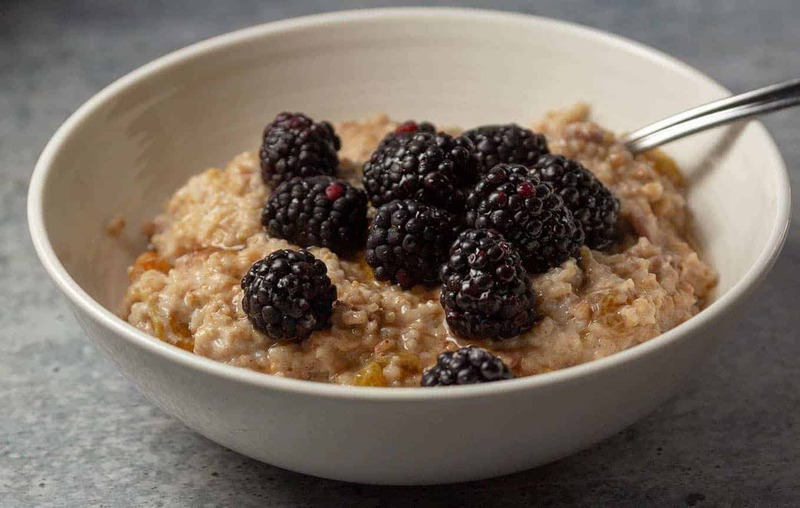 Oatmeal recipes can help to lower your (bad) cholesterol and to regulate blood sugar! There are many delicious oatmeal recipe variations. 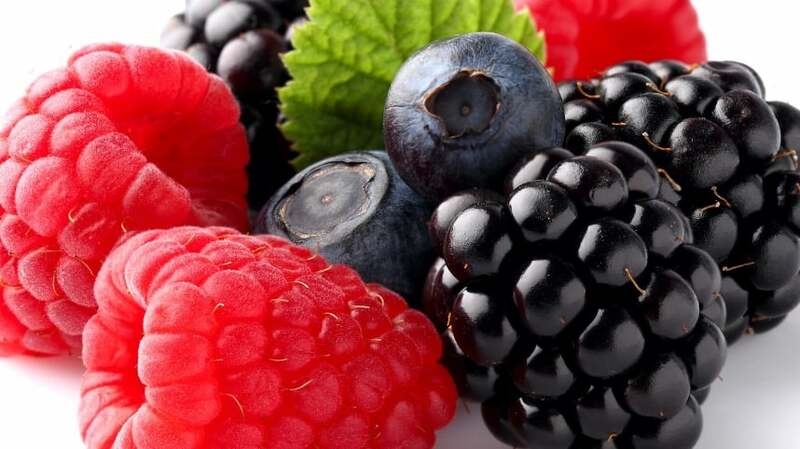 You can choose other fresh fruits like bananas or blueberries or add almonds, dates, walnuts, and even some brown sugar. But I happen to think this oatmeal recipe is the best is the best! 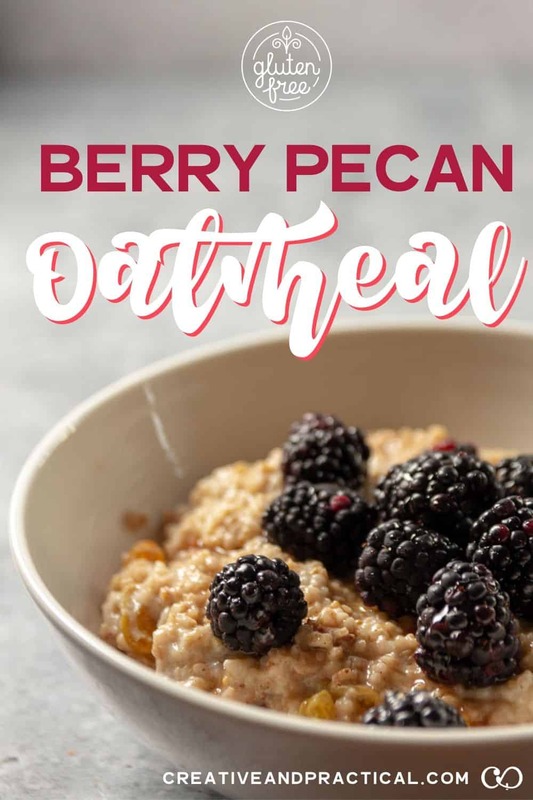 Dairy-free, creamy oatmeal full of delicious flavors. Bring the almond milk to a boil. Add the steel cut oats and reduce the heat to a low simmer. Stir occasionally and cook for 10-12 minutes. Add crushed pecans, raisins, cinnamon and a dash of salt to the simmering oats. Allow the oatmeal to simmer for another 2-3 minutes. Once the oatmeal has reached your desired consistency, transfer it into a bowl. Add fresh berries and drizzle maple syrup on top. Do you like oatmeal? What do you add to your oatmeal? Be sure to use the hashtag #caprecipes on Instagram, Twitter, or Facebook and share your pictures. I’d love to see your creations! Love this oatmeal recipe. But I don’t have any maple syrup on hand. What else could I add as a sweetener? PS: I’d always wondered about steel cut and rolled oats. Thank you for sharing. 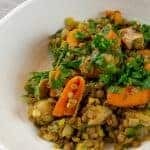 I’m glad like this recipe! No maple syrup, no problem. You can chop up some dates and use them as a sweetener or you can use brown sugar or even a bit of honey.